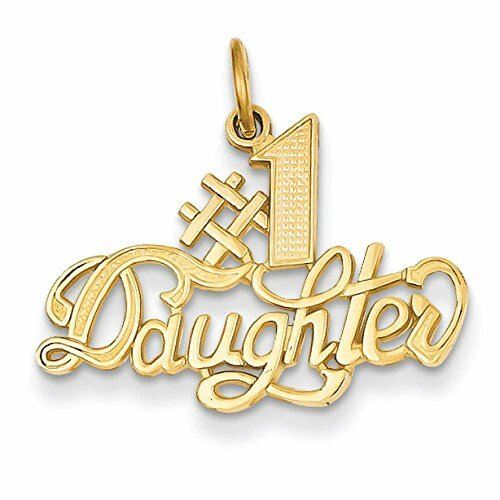 14k Yellow Gold #1 Daughter Casted Polished Charm Pendant 22mmx23mm. Comes in a Gift Box. Features: Solid - Casted - Polished - 14k Yellow gold - Textured back. All Colored Stones Have Been Treated to Produce and Enhance Color: Amethyst - Heat Treated || Aquamarine - Heat Treated || Citrine - Heat Treated || Emerald - Resin/Oiling || Garnet & Rhodalite Garnet - Not Enhanced || Onyx - Dyed || Opal - Impregnation/Dyed/Heat || Peridot - Not Enhanced || Pearls - Bleached/Dyed/Irradiation || Pink Tourmaline - Heat Treated/Irradiated || Quartz - Heat Treated/Irradiated || Ruby - Heat Treated || Sapphire - Heat Treated || Tanzanite - Heat Treated || Topaz - Irradiated/Heat-Treated || Zircon - Heat-treated || Blue, Red & Green Diamond - Irradiated || Black, Brown & Yellow Diamond - Heat Treated/Irradiated. If you have any questions about this product by Venture Gold Charms Collection, contact us by completing and submitting the form below. If you are looking for a specif part number, please include it with your message.